Two versions of this picture exist, printed with the dog facing in opposite directions. Moriyama went to Misawa in New Year 1971 and observred that it had much in common with many base towns, with its øbarbers, cabarets, boutiques, beauticians and oculits… all lined up” and “dogs everywhere”. Urban dogs were often featured in postwar European photography, fighting and snarling, symbolizing animality. 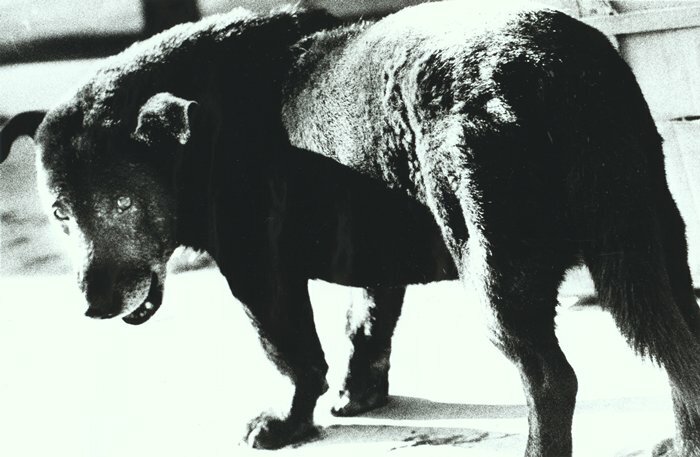 Moriyama’s dog, on the other hand, seems to have been taken from a kindred dog’s-eye point of view, as if merely encountered rather than elevated into a symbolic order. (New York: Phaidon,  2012, p. 54). Born in Ikeda, Osaka, Daidō Moriyama studied photography under Takeji Iwamiya before moving to Tokyo in 1961 to work as an assistant to Eikoh Hosoe. He produced a collection of photographs, Nippon gekijō shashinchō, which showed the darker sides of urban life and the less-seen parts of cities. In them, he attempted to show how life in certain areas was being left behind the other industrialised parts. Though not exclusively, Moriyama predominantly takes high contrast, grainy, black and white photographs within the Shinjuku area of Tokyo, often shot from odd angles. [UPDATE–Oct. 3, 2012] Daido Moriyama just did a short interview for The Guardian’s “My Best Shot” series, where “Photographers come clean on how they created their favourite works”. In the interview, Moriyama mentioned “a shot of a stray dog taken in 1971”. This part of the text links back here. See “Daido Moriyama’s best photograph: my girlfriend’s legs in fishnets” by Sarah Phillips, Oct. 3, 2012. See all entries tagged Daido Moriyama on Aphelis. Daido Moriyama’s official website (Flash required). Daido Moriyama at the Reflex Art Gallery. “Daido Moriyama Photographs His Beloved Shinjuku” an interview conducted by Jiae Kim and published in Theme magazine (issue no 2, summer 2005). “Daidō Moriyama: Tokyo Photographs” was the name of an exhibition held at the Philadelphia Museum of Art (February 28, 2009 – August 23, 2009). The International Center of Photography Library blog: “The Daido Moriyama Photobook Collection at the ICP Library” by Russet Lederman, May 14, 2012. I remember my husband’s purchase of our first Daido Moriyama photobook. In fact, I remember it very well because it was also the very first Japanese photobook we ever bought. At the time, 10 years ago now, neither of us knew that this seemingly innocent purchase would signal the beginning of what we now fondly refer to as our Japanese photobook acquisition disorder. In 2002, he attended a gallery opening for `71-NY: Photographs by Daido Moriyama, an exhibition that took the then risky stance of presenting both photographs and photobooks as equals within a gallery installation. Luhring Augustine Gallery has 58 medium size photos all properly identified. Michael Hoppen Gallery has numerous photos from various series, including the Shomei Tomatsu series and the Thights and Lips series. In 2003, the Fondation Cartier edited a catalog of 200 or so photographs by Daido Moriyama. One can browse through good size samples photographs from this catalog over at the Photo-Eye bookstore.